My RV or Trailer is covered on my auto insurance … right? Well …. Yes and no. That’s going to depend on a lot of factors. Honestly, that’s how most people have their policies set up. It’s also what used to be known as “the norm”. And again, to be honest, it’s how I had my own policy set up until just over a year ago. 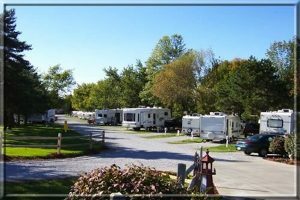 By adding your travel trailer or RV to your auto policy you’re getting the basic coverage that you essentially need if you are traveling to the state park for the weekend or camping at a private campground for a short period of time. Generally, your car insurance coverage will extend to your trailer. However, this typically only applies to liability coverages. If you want better protection for your own property, you will need to have RV Insurance. RV insurance covers many of the similar risks that auto insurance does, including collision, comprehensive and liability coverage. You can also get additional protection for your personal belongings, equipment and attached accessories such as awnings and satellite dishes in some endorsements. The problem becomes when you, like me, start “Glamping“. That’s where we like the comforts of home while we are camping. If you knew my family you would understand why glamping overruled the typical camping agenda. Essentially we keep our camper parked at the campground in the same lot year round. We lease the lot, have a fence, patio furniture, shed and even purchased that lifted golf cart! This type of camping poses certain risks. For one, you have a leased location for a season or even an entire year. If you are renting your lot at a private campground or state park for the weekend or week, typically your auto insurance and home insurance liability would kick in if something were to occur. However, once you sign a lease for something more seasonal or even annually that opens the door to a list of other liability concerns. Typically, your home insurance and auto insurance will not extend to cover a leased location like this. While you might have comprehensive or collision coverage, you are leaving huge liability coverage gaps leaving you and your family vulnerable. Vacation Liability – Pays up to specified limits (your choosing) for bodily injury and property damage for which you are legally responsible for as a result of an accident that occurs while the RV or Trailer is used as a temporary vacation residence. Fire Department Service Charge – This coverage pays up to $1,000 for your liability that is assumed by a contract or agreement for fire department charges incurred when the fire department is called to save or protect your RV or Trailer. Total Loss Replacement/Purchase Price – available on newly purchased RVs up to one model year old. Agreed Value – Protects your investment in the RV without the worry of depreciation for total losses. Actual Cash Value – The RV or Trailer will be settled by paying the lesser of the actual cash value or the amount necessary to replace the stolen or damaged property value of the RV or Trailer at the time of loss. There are many options available to you to make sure that you are protected. I would suggest talking with your independent insurance agent or give me a call today just to review your options and make sure that you are properly covered. The last thing you want is to be notified after its too late that you don’t have the coverage you thought you had. Previous Post: I’m renting a car …. do I need to purchase their coverage? Next Post: What’s going on with Travelers?